A self-contained 2-Bedroom garden suite at Oak and West 17th, V5Z 1V5 1. Monthly rent does not include utilities (about $45 monthly in average). Internet is shared. 2. Location: 937 West 17th (1/2 block east of Oak street, on quiet west 17th), Vancouver, 3. Available March 1. 4. Clean and bright, at ground level (about 800 Square Feet) in a house. 5. 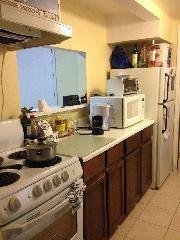 Stove, refrigerator, shared washer and dryer (not coin operated). 6. Close to VGH, UBC and downtown, banking, shopping etc. 7. Facing sunny southern front yard. 8. Bike storage is available. 9. One reserved parking space in the back. 10. No pets, no late parties, no smokers, no illegal drug users, no heavy drinkers. The premises promotes a healthier environment with no smoking or holding of lighted tobacco or cannabis, and the use of an e-cigarette or other vaping devices. Previous landlord/employer reference required. 11. Kindly send an email with your contact phone number. Indicate if you are a student or are working fulltime along with a brief description of yourself (and partner) and why you will be a good tenant. UV Rentsline is not responsible for any accommodation agreement negotiated between the tenant and a private homeowner or other commercial establishment and therefore is not responsible for any damages or injury that may occur during the time of accommodation.